The Health Insurance Portability and Accountability Act (HIPAA) and the Health Information Technology for Economic and Clinical Health (HITECH) mandate the standards companies need to follow to protect and maintain the confidentiality of personally identifiable health care information. An added benefit of compliance with HIPAA and HITECH, which is mandatory for all entities that transmit healthcare information, is that it allows you to proactively dodge both external threats and insider privilege abuse. DataSecurity Plus has extensive reports to help you meet HIPAA and HITECH's data security standards. With these reports, you can draw meaningful insights on accesses, modifications, and permissions of critical files to help mitigate insider threats. 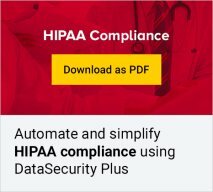 * Using this HIPAA compliance tool you can also generate customized reports based on file path, users, business hours, etc.